Thanks to T.J. Screene (co-organiser of Bluegrass Camp Ireland and resident bassist at the weekly Dublin Bluegrass jam session) for news of the Crossover Bluegrass & Old-Time Music Festival, to be held in the Clonter Opera Theatre, Congleton, Cheshire, England (fairly accessible from Ireland) on 4-7 May this year. T.J. met the organisers at Sore Fingers Week. 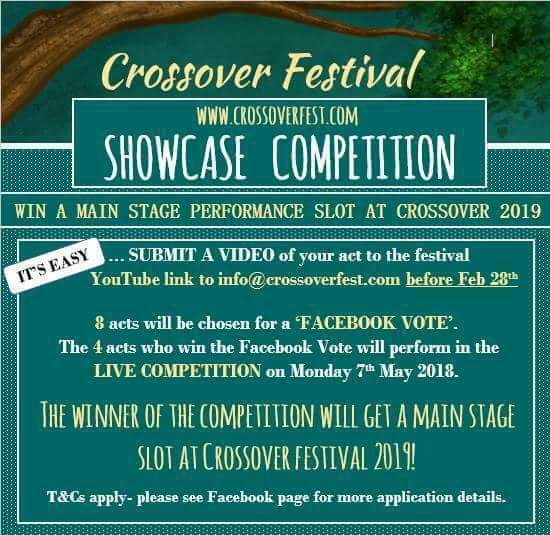 The news is specifically of the Crossover Showcase Competition, as shown on the poster image. 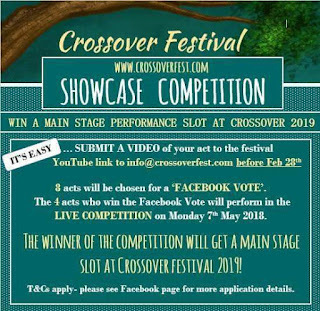 Submit a video of your act to the YouTube link to info@crossoverfest.com before 28 February. Eight acts will be chosen for a 'Facebook vote'; the four semi-finalists will perform in a live competition at this year's event on 7 May; and the winner will get a main-stage performance slot at the 2019 festival. This year's event has a powerful lineup (headed by Molly Tuttle (USA), who after Crossover will play at the Kilkenny Roots Festival) with several wholly or partly Irish acts (Paddy Kiernan, Cup O' Joe, Midnight Skyracer, Propane Brothers, Hot Rock Pilgrims) and others who have played over here.